The Simple English Wiktionary has a definition for: beg. Begging means asking people for money, food, shelter or other things, when one is not able to give anything instead. It is also referred to as sponging, spanging (short for "spare-changing") or (in American English) panhandling. In larger cities, it is common to see beggars who ask for money, food, or other items. Typically, beggars often beg for spare change using coffee cups, mugs, small boxes, hats, or other items into which monies can be placed and sometimes display signs with messages such as "Help me. I'm homeless." Because of this, some people say that it would be better to give the beggars gift cards or food/service vouchers, instead of money. Some shelters also offer business cards with information on the shelter's location and services, which can be given instead of cash. Asking customers inside a store or restaurant. Asking after dark, in a secluded area. There have been reports of beggars who will try to have their limbs amputated in the hope that they can get more out of sympathy. Nicholas Jennings in Thomas Harman's "Caveat for Common Cursitors"
↑ "Real Change, not Spare Change". Portland Business Alliance. Retrieved 2006-09-30. ↑ Peace Studies Program. "Homelessness Contact Cards". George Washington University. Retrieved 2006-09-30. 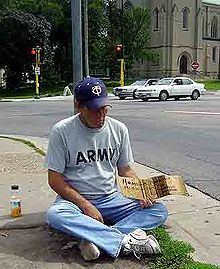 Wikimedia Commons has media related to Begging. This page was last changed on 23 January 2018, at 09:55.